The KIP 9900 Print System is created for those in high-production environments. 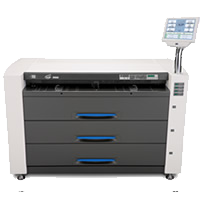 It has the ability to produce 22 D-sized prints every minute which makes it one of the fastest wide format production systems around. The KIP 9900 Print System are a new standard in quality high-demand technical document printing jobs. With clear detail and excellent half tones and gradients, the KIP 9900 will get the job done right.